Make your sweetheart some delicious chocolate brownies! Spray a ¼ size sheet pan and cover bottom with parchment paper. Melt chocolate and butter over a double boiler. Whip eggs and sugar until light and fluffy ("ribbon" stage). Sift flour and cocoa powder together, set aside. Fold chocolate and butter mix into the whipped eggs and sugar. In three segments, fold in sifted flour and cocoa powder. Pour batter into the sheet pan and smooth evenly. Bake in a 325°F oven for 45-50 minutes, until a toothpick comes out clean. They will continue to cook while cooling on rack. Cool at room temperature for 30 minutes, then place in the refrigerator for an hour. 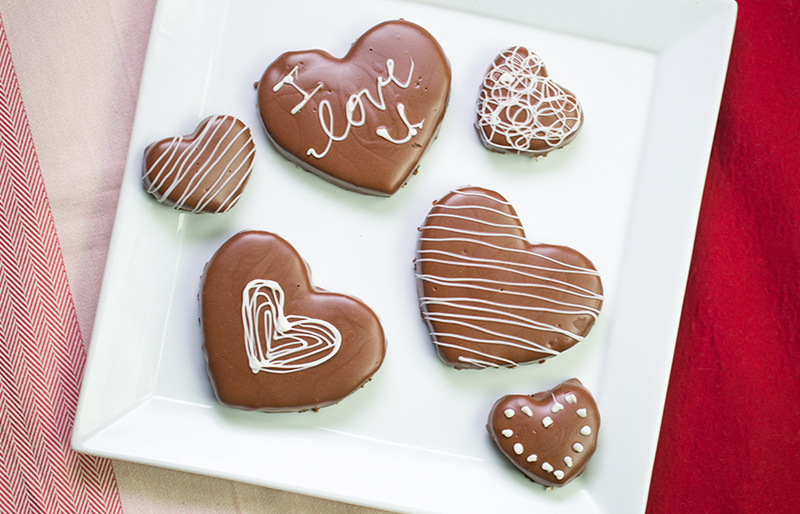 Once cooled, turn brownies out of the pan and cut shapes using a heart-shaped cookie cutter. Place hearts on a cooling rack set over a sheet pan. Melt Grand Orange Ganache and pour over the brownies, nudging slightly with a knife or spatula to avoid "feet" and to make sure the brownies have clean edges as they rest. Melt white chocolate and pour into a paper cornet (coned-cup), cut tip, and drizzle design or stripes over brownies.